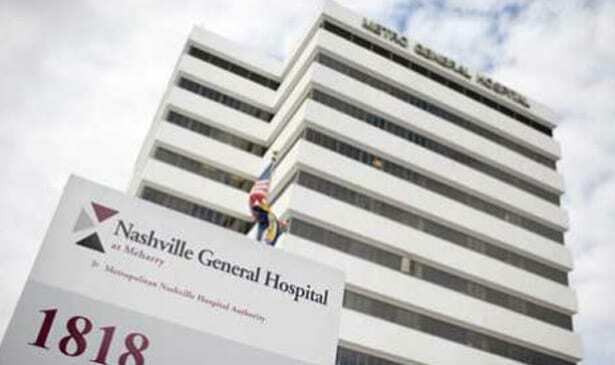 NASHVILLE, TN — As Nashville General Hospital celebrates its 128th anniversary in 2018, it’s sharing an important message with the community: Nashville General Hospital is here to stay. The hospital opened in 1890 and has since served as a place where residents who do not have insurance or are unable to pay can still receive the healthcare services they need. 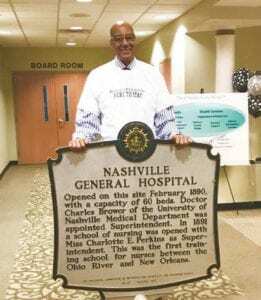 Nashville General Hospital CEO Dr. Joseph Webb poses with a historical marker detailing the hospital’s history. Photo courtesy of Nashville General Hospital. The hospital and its staff were uncertain of its future until they received a $17.1 million subsidy from metro government to support the hospital through the end of its current budget cycle, allowing its doors to remain open. Though Nashville ranks number 42 among 50 metropolitan cities in worst health outcomes, one of Nashville General’s most significant accomplishments is the implication of the chronic care model that tackles the city’s serious issue with chronic diseases such as hypertension, congestive heart failure and diabetes through the Patient-Centered Medical Home that has received the highest accreditation by the National Committee for Quality Assurance. In its 128-year history, Nashville General has served as a safety net for those on low income, but still require quality healthcare. Brandes said the hospital will continue to fill that role as it moves forward, planning to expand the medical home program, as well as become an index hospital for Meharry Medical College. Previous articleA 50-Year March in Time with Young and RFK, Jr.